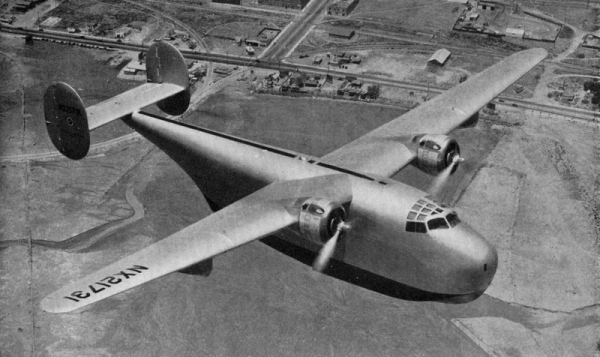 The Consolidated Model 31 was the first aircraft designed with a high aspect-ratio Davis Wing. This increased fuel efficiency and was later used on the B-24 Liberator. The Model 31 made its inaugural flight on May 5, 1939 and it left no doubt that Reuben Fleet’s $1 million gamble had paid off. The test pilot, Bill Wheatley, reported that the airplane had the performance of a pursuit plane. The top speed on the test was reported at 250 mph and the range was anticipated at 3,500 miles. The Davis wing had 20% more performance than any other comparable airplane.3 By comparison, the PBY had a top speed of approximately 170 mph and a normal range of only 2,500 miles. The Model 31 had proved so successful that it was decided that the Davis wing would be incorporated into the design of the B-24 Liberator. The fuselage was an aluminum flush-riveted construction and had two decks with one flight compartment and eight additional compartments. The flight compartment was completely sound proof. 4 It had a cantilever straight wing with internal fuel tanks and was equipped with hydraulically controlled Fowler flaps. The flaps were fabric covered as well as the flight controls.5 The tail unit was mounted above the fuselage, with two oval shaped vertical stabilizers mounted on each side of the horizontal stabilizer. (The same tail would be used on the B-24.) It had two retractable underwing floats and hydraulically controlled tricycle beaching gear. 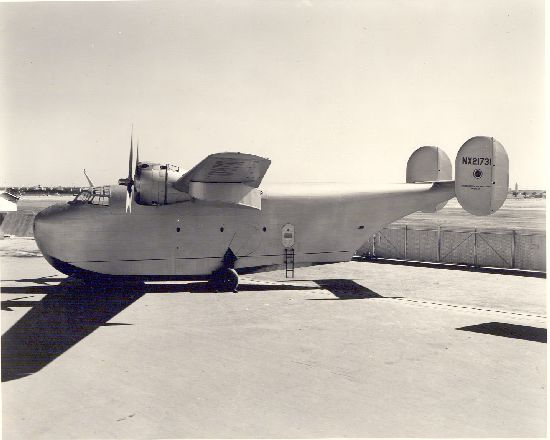 It was powered with two 2,000 hp Wright Cyclone R-3350 twin-row radial engines.6 It had accommodations to carry either 52 passengers or 28 for the sleeper version. 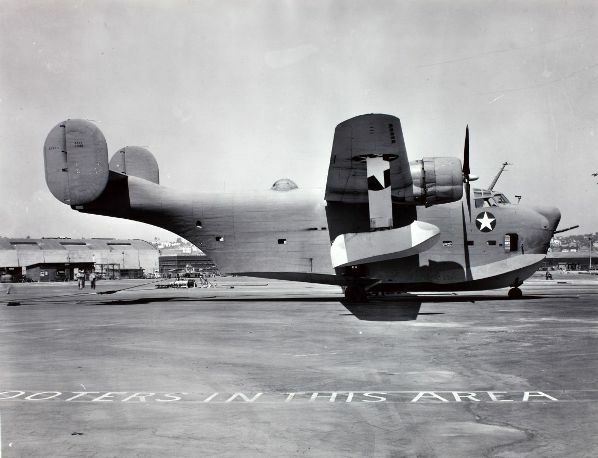 The US Navy purchased the sole prototype and designated it as the XP4Y-1—it was later named Corregidor. Armament was added and consisted of one 37mm cannon nose turret, two .50 caliber machine guns in the tail and dorsal turrets and provision to carry 4,000 lb. bombs externally. An order for 200 aircraft was placed in October 1942, but due to design delays and a shortage of Wright Cyclone R-3350 engines (the engines were reserved for the Boeing B-29 Superfortress), the order was canceled. Two Wright Cyclone R-3350 2,000 hp (1,491 kW) 18 cylinder radial engines. Provision to carry 4,000 lb. bombs externally. 1. William Wagner. Reuben Fleet and the Story of Consolidated Aircraft. Fallbrook, California: Aero Publishers, Inc., 1976. 206. 2. Allan G. Blue. The B-24 Liberator, A Pictorial History. New York: Charles Scribner's Sons, 1975. 11. 4. Glenn D. Angle, ed. Aerosphere 1941. New York: Aircraft Publications, 1941. A-32. 5. David Mondey. The Concise Guide to American Aircraft of World War II. New York: Smithmark Publishers, 1982. 66. 6. Howard Mingos, ed. The Aircraft Year Book for 1940. New York: Aeronautical Chamber of Commerce of America, Inc., 1940. 220. Created September 27, 2013. Updated October 13, 2013.